The Center for Communication Disorders at MidHudson Regional Hospital is the premier provider of speech, language and hearing services in the Hudson Valley. The center’s team includes licensed and certified speech-language pathologists and audiologists who provide the highest quality services while ensuring the best possible care for all ages - from newborns to the elderly. We have served the mid-Hudson region since 1955. Offices are located in Poughkeepsie and Beacon with convenient hours including late evening hours. Aphasia is a language disorder that affects a person's ability to communicate and is most often caused by a stroke that occurs in areas of the brain that control speech and language. Whether you’ve been living with aphasia for years or recently diagnosed, our monthly support group strives to bring people facing similar difficulties together in a positive, relaxed atmosphere aimed at fostering better communication through fun, education and practice. 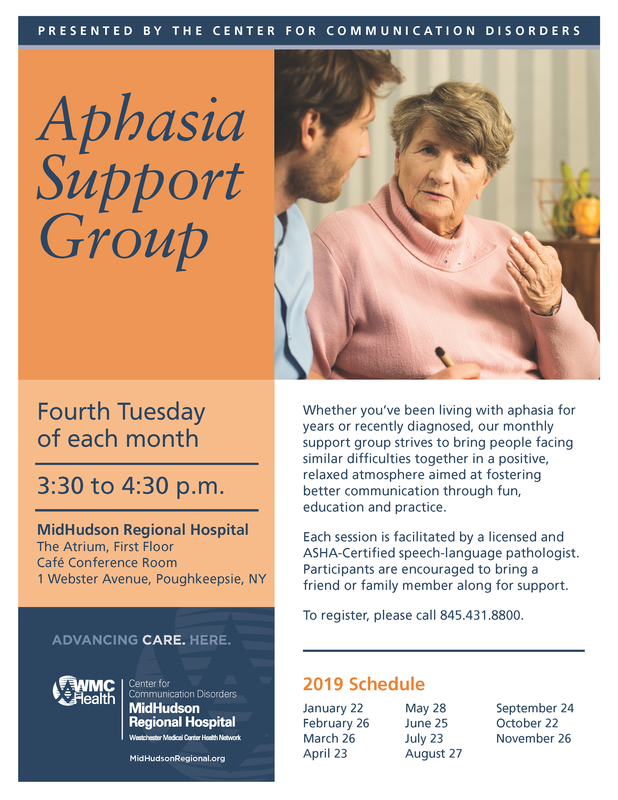 The Aphasia Support Group is held on the fourth Tuesday of each month from 3:30 - 4:30 p.m. in the Atrium, First Floor Cafe Conference Room at MidHudson Regional Hospital. Each session is facilitated by a licensed and ASHA-Certified speech-language pathologist. Participants are encouraged to bring a friend or family member along for support. To register, please call 845.431.8800.